Poha Flattened rice (also called beaten rice) is also called Avalakki in Kannada, Atukulu in Telugu and Aval in Tamil.Mixed Vegetable Poha.. A simple yet tasteful way to start a beautiful day.A Quick and delicious recipe for a morning breakfast or evening snack. 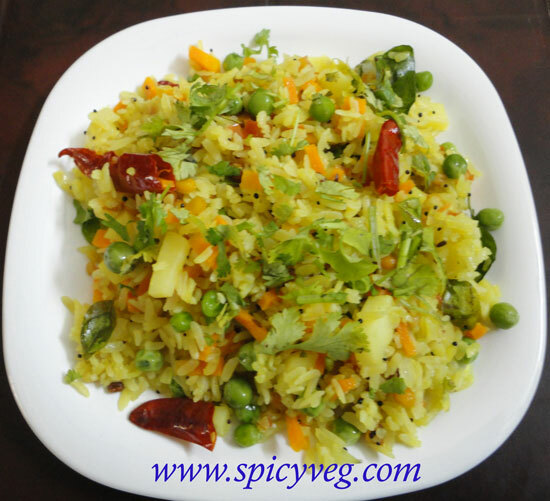 Lots of fresh veggies makes the Poha healthy and yummy. You can use any type of Poha,I personally prefer Thick Poha as it doesn't become mushy.Poha with vegetables is a one pot meal which you can enjoy with a hot cup of tea and some ketchup.Vegetable Poha is easy to make at home for evening snacks or breakfast. Poha is a light and nutritious recipe.This is a comparatively heavy yet healthy ,full of nutrients and delicious to fill the stomach. Coriander leaves - 2tbsp Chopped. 1.Wash Poha with cold water and drain all the water. Set it aside. 2.Now heat oil in a pan and add in the mustard seeds,urad dal,channa dal and red chillies. 3.Now add chopped potatoes. Since potatoes take a little longer to cook . 5. Cook them again for another 4-5 minutes and then add chopped onion and green chillies. 6.Stirring occasionally let all the vegetables cook well. After the vegetables are cooked add salt and turmeric. 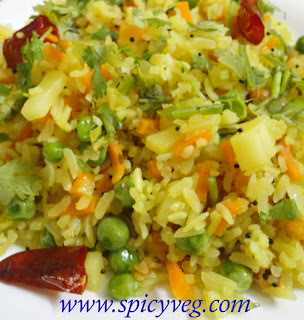 7.Mix everything together and then add poha to the vegetable mixture. 8.Turn heat to very low and gently mix all the ingredients, poha is very soft so you don't want it to get mushy. If you think its a little dry for you as it sometimes happens, just sprinkle a little water on it and mix everything. 9. Turn of the heat and cover your pan with a lid and let it sit for a few minutes. 10. Sprinkle lime juice and chopped coriander and serve hot.